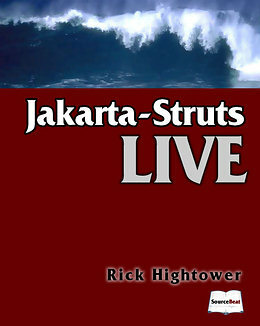 Jakarta Struts Live contains thorough coverage of both the Struts MVC architecture and building each of the Struts components of this architecture. You'll learn to use vital features like Tiles, the Validator, DynaActionForms, plug-ins, and internationalization. You also look at how you can leverage other open-source technologies to improve your Struts development process and experiences. components of this architecture. You'll learn to use vital features like Tiles, the Validator, DynaActionForms, plug-ins, and internationalization. You also look at how you can leverage other open-source technologies to improve your Struts development process and experiences. For those of you not familiar with the SourceBeat model, our titles are available as one year subscriptions. Our expert authors update their titles each month, ensuring you are receiving the most up to date information on the open source topic. In addition, you can interact with the author via our blogs and help shape the future chapters of the titles. Rick Hightower is the owner of the Struts Live title for SourceBeat. Rick is a best-selling author of books such as Java Tools for Extreme Programming and Python Programming With the Java Class Libraries. Rick has also written tutorials and articles for IBM DeveloperWorks and Java Developer's Journal. In his spare time, Rick is CTO for ArcMind, Inc.